The Task Force on Climate-Related Financial Disclosures (TCFD) released its draft Recommendations Report in December 2016. The initiative – set up by the Financial Stability Board – will develop voluntary, consistent climate-related financial risk disclosures for use by companies in providing information to investors, lenders, insurers, and other stakeholders. The task force launched a 60 day public consultation on the Recommendations. A changing climate, as well as the societal responses to contain and cope with it, will have deep implications for global patterns of production, consumption, and investment. Climate change will manifest in a variety of forms: the frequency and intensity of extreme weather events will continue increasing considerably; longer-term gradual shifts such as sea-level rise, glacier melt, and desertification will accelerate; while policies and technologies – particularly in the world’s energy and food systems – will need to be deployed at scale to facilitate near-full economic decarbonization by the second half of this century. For businesses, risk and opportunity landscapes will shift: the transition to low-carbon, climate-resilient pathways will require new technologies, business models, products and services, with financial consequences for financial institutions. Disclosure on climatic risk exposures, as well as on the strategies that organizations are responding with to manage risks, is considered a key instrument to ensure that the climate economic transition is as smooth and ‘undisruptive’ as possible. To help advance climate disclosure that is sufficiently widespread, standardized, and meaningful, the Financial Stability Board (FSB) under Mark Carney mandated an international Task Force on Climate-Related Financial Disclosures (TCFD) under the chairmanship of Michael Bloomberg to develop corresponding recommendations. The final draft for consultation of the Task Force’s recommendations was published on 14th December. Find the report here. Given the relevance of UNEP FI’s constituency to the TCFD, as well as the relevance of the TCFD recommendations to UNEP FI members, UNEP FI consulted with its members and the consolidated response which has been sent to Michael Bloomberg is available here. One of the novelties of the TCFD is that it considers finance market actors – explicitly across insurance, banking, investment (AOs & AMs) – not only as readers but also as issuers of climate-related risk information; which makes its overall work, the recommendations being made, and their expected adoption going forward, all the more relevant to a finance sector audience. To ensure UNEP FI members are fully briefed on the Task Force’s recommendations a special UNEP FI Webinar will be offered on 11 and 12 January, 2017. Members should contact Remco Fischer at remco.fischer@unep.org for details. For more information on this initiative, please read the following UNEP FI reports, available on the website. 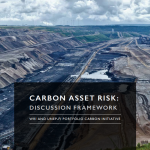 The Carbon Asset Risk Framework offers guidance to a range of financial institutions to systematically address the financial risks linked to carbon-intensive business models and assets. Read the report here. 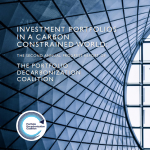 The second annual progress report from the Portfolio Decarbonization Coalition (PDC), provides an introduction to the coalition and an overview of the decarbonization approaches and strategies of its members. Read the report here. 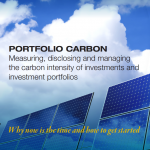 In this Investor Briefing, UNEP FI provides a clear and compelling case for why and how investors and their service providers should start measuring, disclosing and reducing the GHG emissions associated with their investments and investment portfolios here.